Hi folks, the Eagle Rock paint-out continues, we painted at a beautiful house last week, high up on a hill with surrounding views of Occidental College and desert foliage (cactus). I did a pretty lousy WC, but my wife did a very nice oil of a little stone path leading down a prickly slope to a house with an orange tile roof. Don’t forget to attend The Collaborative Eagle Rock Beautiful Event Sept. 13th and 14th, at the GLAD center, 2222 Laverna Ave., Eagle Rock CA 90041. The big Gala event is from 4 Pm to 7 PM at the GLAD center on Sept. 14th, $35.00 donation gets you champagne, hors d’ouvres and admission to a sale of fine paintings of Eagle Rock created just for the event, and succulent drought-tolerant plants will be for sale as well. We’re lining up a woodwind music group to play at the event as well, tres elegant! In case you missed it in a previous post, this is to help preserve the last open space between Eagle Rock and Pasadena, and to keep the area landmark, the Eagle Rock, from being blasted out for Condos! Help (PLEASE!) CERB raise the remaining 70,000 dollars and keep the Eagle flying! I’m switching my Cable and DSL services to AT&T next week, so my email address for this blog will change to blogmolasses@att.net. This is the new fiber optic cable, I’ll let you know if there is any improvement in reception or DSL speed. It sure will be cheaper, that’s for sure. 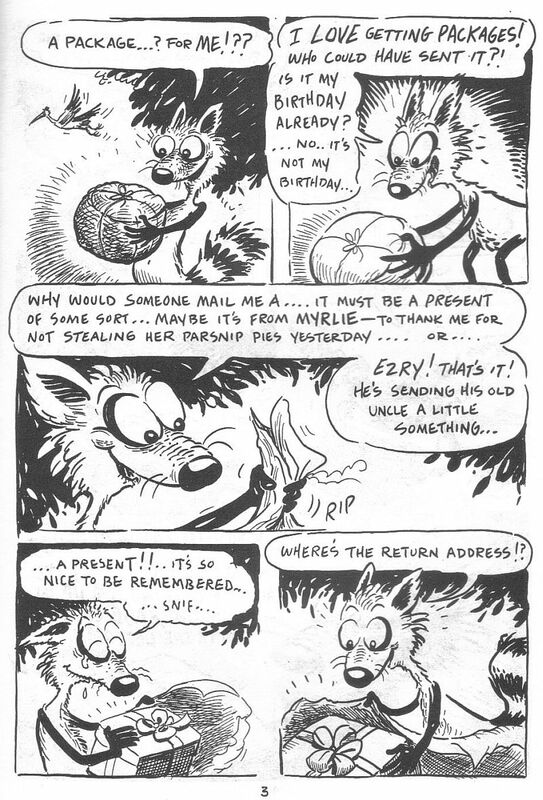 Comics this week are the last page of “A Package For Virgil” featuring Mangy the cat as Virgil’s big surprise! Also I’m starting another Mangy story, “Mangy’s Blues”, done in modern graphic style, sans dialog, all by my incredibly talented Cathy! MARVELOUS MIKE this week is from 9/17 to 9/22/1956: Mike and Merrie start a “homework answering service” much to the horror of the school-board! 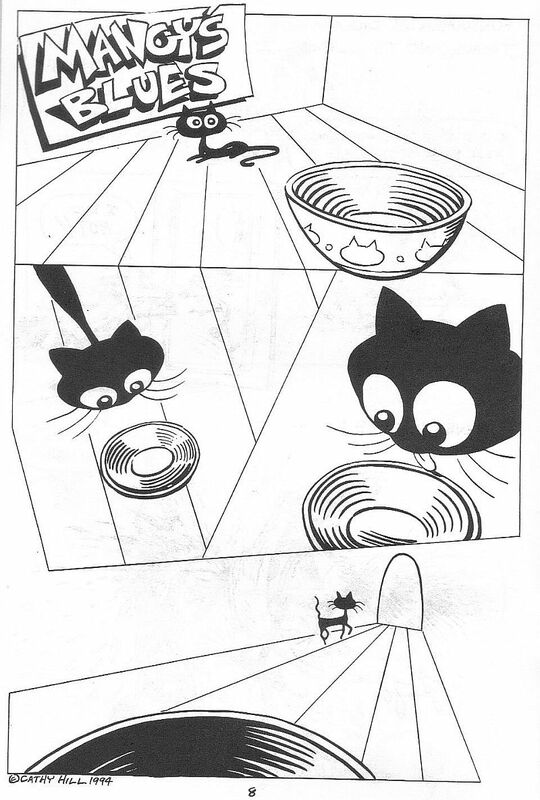 Check out Krazy Kat this week 2/6-2/11/1939, for a lot of “helmet jokes” and the mysterious disappearing Ignatz in Pupp’s jail. 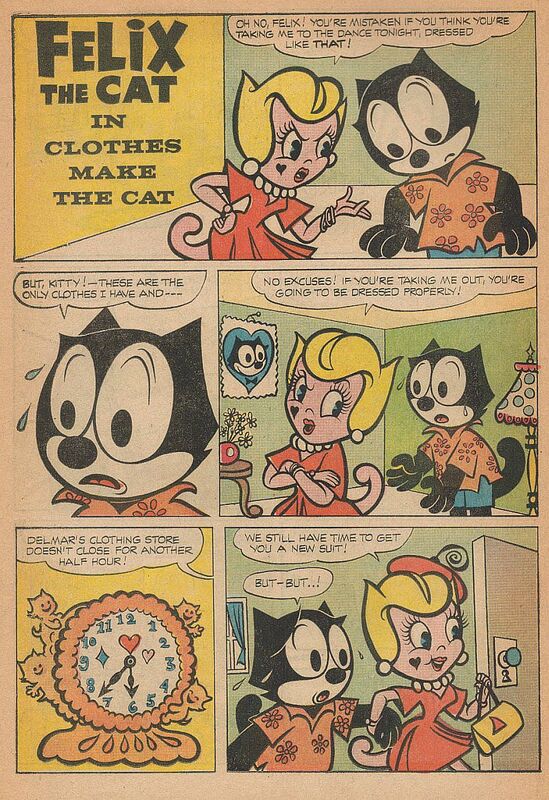 Felix returns with pages 2 and 3 of “Clothes Make the Cat” from Felix #6. 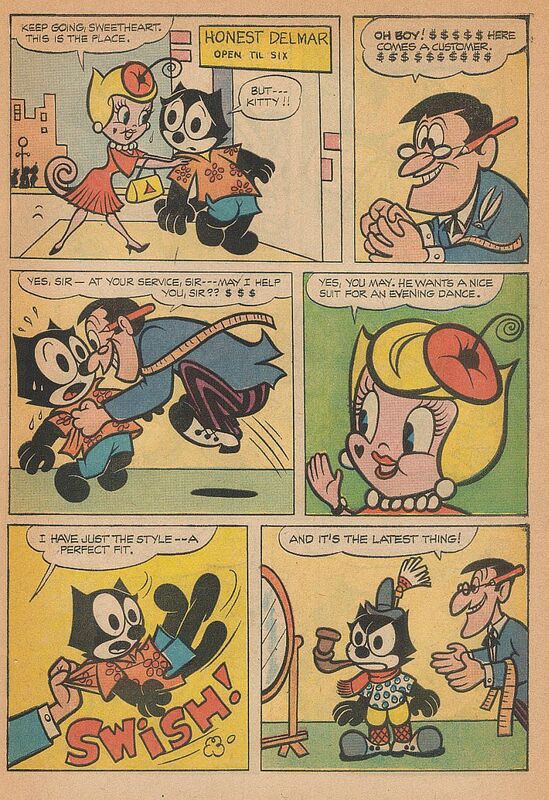 Tyer is in fine form, with funny drawings of the maniacal suit salesman, and Kitty’s girlish amusement at Felix’s shopping phobia. Be seeing ya! Rest in Peace Bill Stulla and Harry Gibbs, two childhood heros, hosts of local kid’s TV shows in Los Angeles and St. Louis, Mo., I’ll be seeing ya wranglers! Hi Readers! Currently, we are painting in various locales around the town of Eagle Rock, CA. The big rock that the town is named for is in danger of being blasted out to clear the land for condominiums, so we are trying to raise 70,000 dollars to buy the land around the rock to keep the developers away. Our group is creating paintings of the town to celebrate Eagle Rock and to bring people’s attention to what makes the town special, the Rock! A Gala event on Sept. 13th and 14th at the historic Women’s Temperance League building, will have a live paint-out with many fine artists participating. If you live nearby, come out to the event! I will post more details next week. Or just write to me at blogmolasses@att.net to get a flyer. PLEASE NOTE NEW EMAIL ADDRESS FOR THIS BLOG!!! THANK YOU!!! This week’s comics are the penultimate page of “A Package For Virgil”, can you stand the suspense? The exciting conclusion to the story will be next week. MARVELOUS MIKE is from 9/10 to 9/15/1956 and concludes the saga of “The Serenader”. Once again, Mike’s talents are ignored and disbelieved and Mike quotes from Sir Walter Scott. 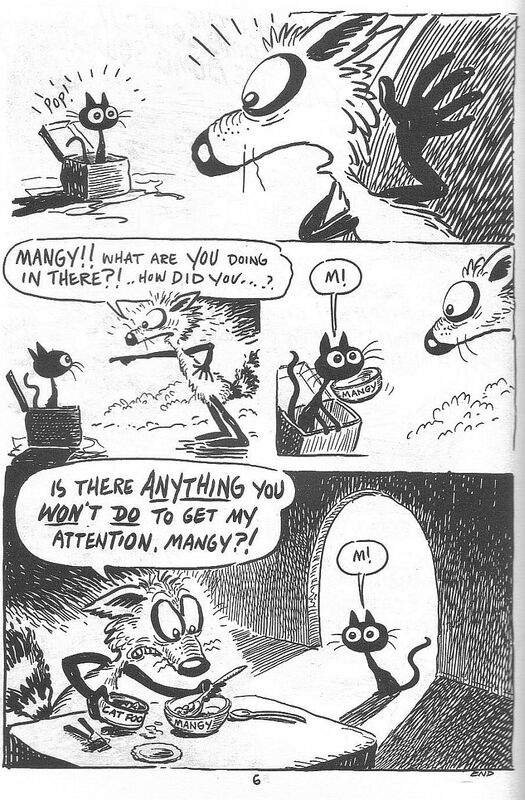 Krazy Kat this week is from 1/30 to 2/4/1939. Mostly “Brick Antics”, the little sign on the fence in the 2/3 episode means “Big Flea Circus” in English. There is a freeway offramp near La Jolla called “Las Pulgas”, must be a pretty flea-bitten offramp! 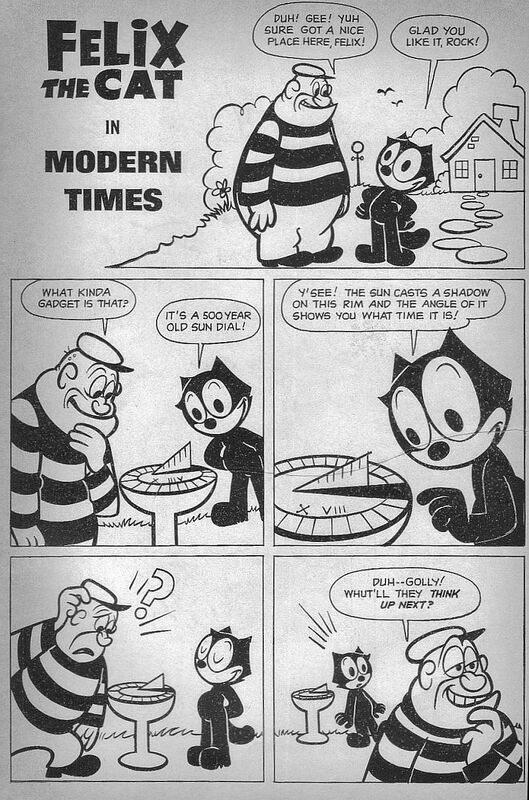 The cat’s tail this week is a one page gag from Felix #5 by Jim Tyer starring Felix and Rock (not Bottom, but from “Rock and Rollo”), and the first page of “Clothes Make the Cat” from Felix #6. I love the design of that clock with the little cherubim kittens around it and Kitty’s “Beauty Mark” on her cheek. C.U. Hello again, readers. Cathy and I had a most memorable painting experience last Thurs. August 7th. We visited Naples! No, not Italy, but Naples, California. You can reach this Naples by driving down the 405 freeway south to Studebaker Road. Go right on Studebaker Road and left on Marina Drive. Make a right on 2nd Ave. and proceed to Naples. Naples is a small, hidden little village surrounded by Alamitos Bay. If you walk down a street called “The Toledo”, you will come to bridges that cross over the circular walkway that ambles along by the seawater stream. Walk down these lanes, and you will be transported! The homes, some new, some Victorian and Greek in style, sport balconies that look out over the water. Each home has a little dock in front of it, many with sight-seeing craft anchored there. A lot of the homes have gardens; flower and vegetable. A friendly black cat was napping underneath one of the chairs; he jumped up on the wall when we passed by and rubbed his head on our hands, then took a playful swipe at us with his paw, meowing in a raspy tone. Naples, California rivals Venice, California both in charm and how human housing can interact with the sea. Ideal painting spots would be up on the bridges to get a wide view of the sea canals, boats and homes. My poor powers of description can’t match the joy of being there, come and look! We didn’t actually paint in Naples on Thurs. but instead parked along Marina Drive and set up by Alamitos Bay in the boatowner’s area. The Harbor Police are there, as are many restaurants. We painted a sailboat race from Naples to the breakwater, and a beautiful yacht anchored nearby with highly polished wooden trim all over it. It was great painting weather, until the wind came up and pushed us (the Thursday Painting group) off our bayside perch. Bring your sketchbooks to Alamitos Bay and Naples (they are in Long Beach), very soon. It’s another little corner of beauty in the ugly and lovely County of Los Angeles. 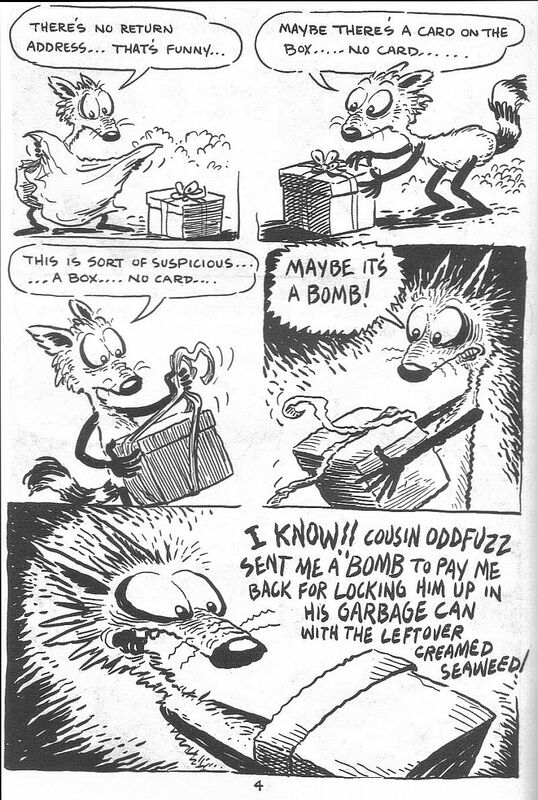 This week’s comics are pages three and four of “A Package For Virgil” from Cathy’s MAD RACCOONS #7. 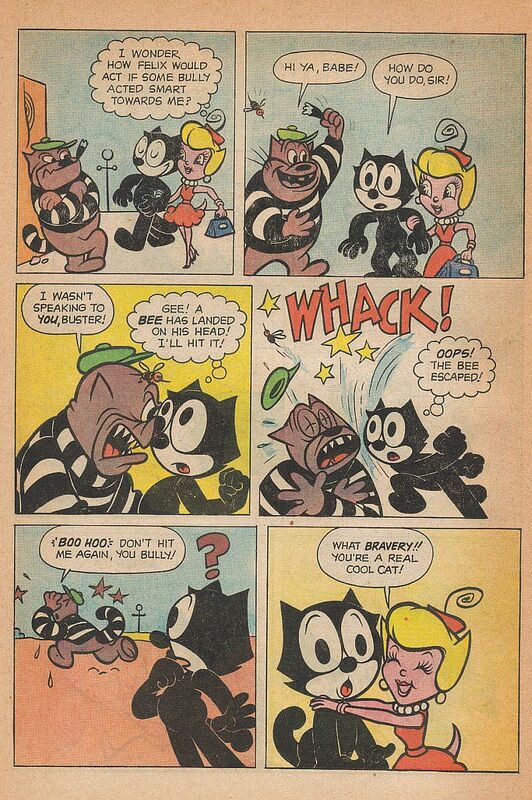 Virgil the raccoon was one of the featured characters in the comic books, he could go from placid to manic in a few panels, as you see here. Mangy is the co-star, but you’ll have to wait to see her. There are only 5 episodes of MARVELOUS MIKE this week, from 9/4/56 to 9/8. 9/3 is missing, donations gladly accepted! “The Serenader” storyline continues, with Cliff hiding from the mob while Mike plays on. 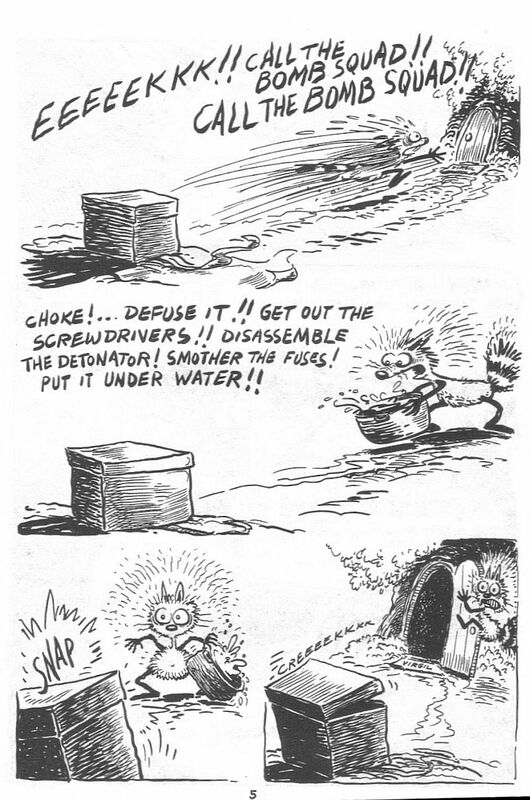 Krazy Kat this week is the complete week’s strips from 1/23 to 1/28/39. I really like 1/25, as Herriman makes fun of his own laziness by not completing the last panel, and making a gag out of it. The only real continuity in this week’s KK’s are 1/27 and 1/28 in which Krazy meets two fireflies, one widowed and one with a wet husband. 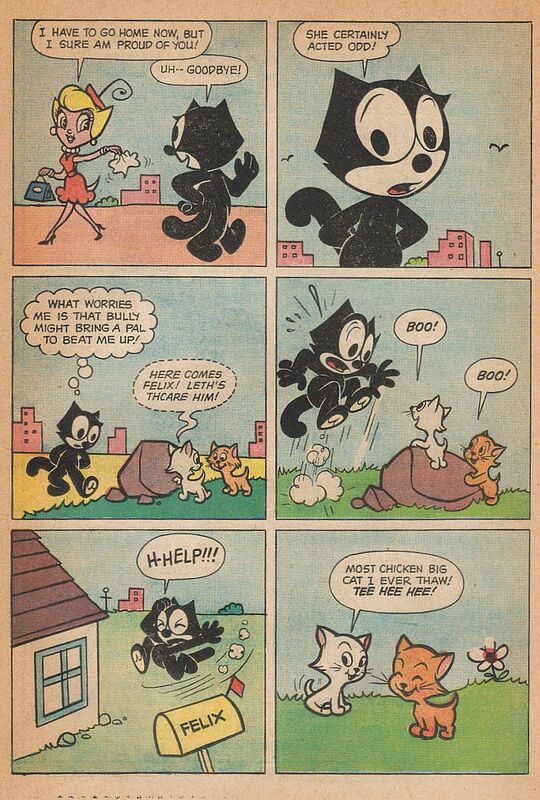 I have also re-printed the final two pages of Jim Tyer’s “Some-Her” from Felix the Cat #5. 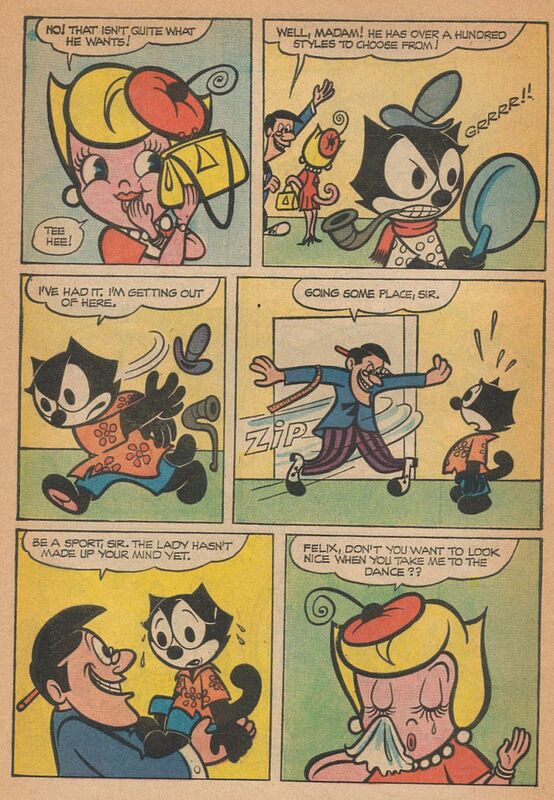 My favorite panels are Felix socking the bully on page four and his big reaction to the mischievous kittens on page five. Enjoy the strips! Any reactions may be sent to molasses@earthlink.net. You are currently browsing the Mark Kausler's CatBlog blog archives for August, 2008.